Mr. Dykshoorn was buried with his “divining rod,” a thread of piano wire that served, as he wrote in his book, “as an aid to my concentration” during case work. 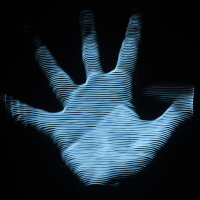 Many systems of clairvoyance involve the observation of a delicate apparatus–a thin wire, a stream of smoke, a candle flame or the hiss of white noise–which exists in a borderline state and is thus highly sensitive to the influence of forces both seen and unseen. 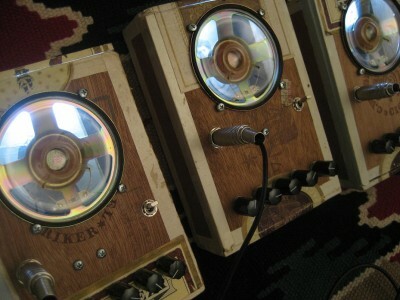 The non-linear feedback loop between a loudspeaker, microphone and high-gain amplifier circuit responds dramatically to minute changes in its immediate environment, fulfilling the requirements of both a potentially chaotic system as well as the needs of the would-be psychic investigator. 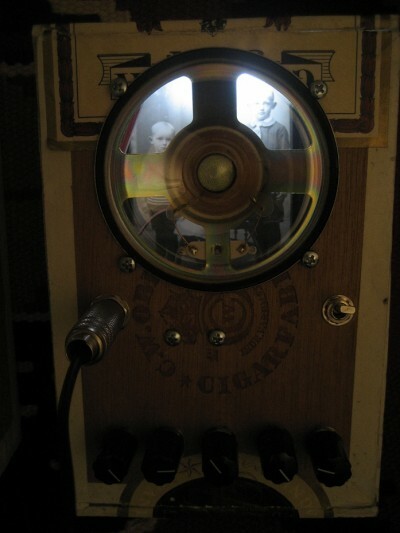 The Ghost Locket Triptych was created between 7-11 October 2011 in Aarhus, Denmark for a battery-powered seance executed by Derek Holzer and Kristian Hverring on the evening of 12 October. These lockets use locally-sourced materials embodying certain historical resonances noted by the artist during his stay here. 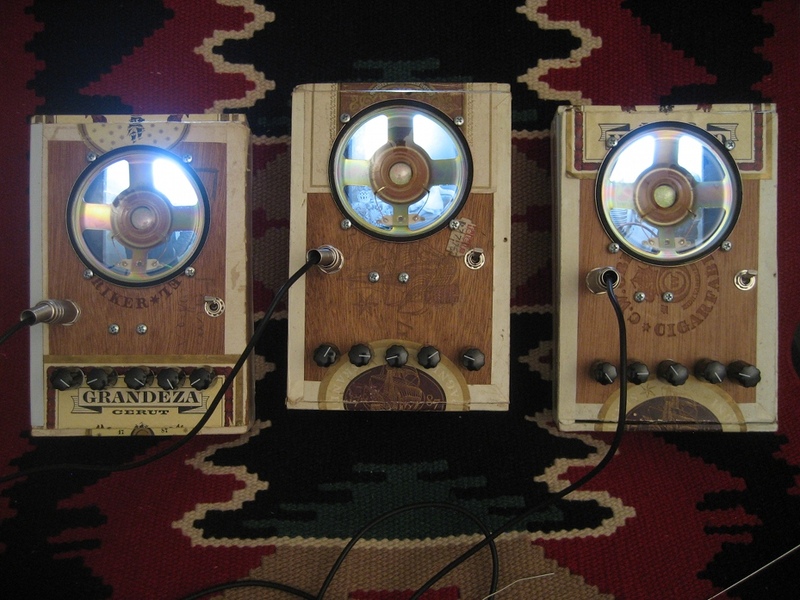 Internally, each locket contains a hand-built Germanium transistor distortion circuit, a 1/2 Watt audio amplifier, a small speaker, a source of illumination and an antique photograph–the ghost within each machine. The artist remains indebted to a series of conversations with the estimable Mr. Martin Howse of London and Berlin for inspiration in these and other matters. 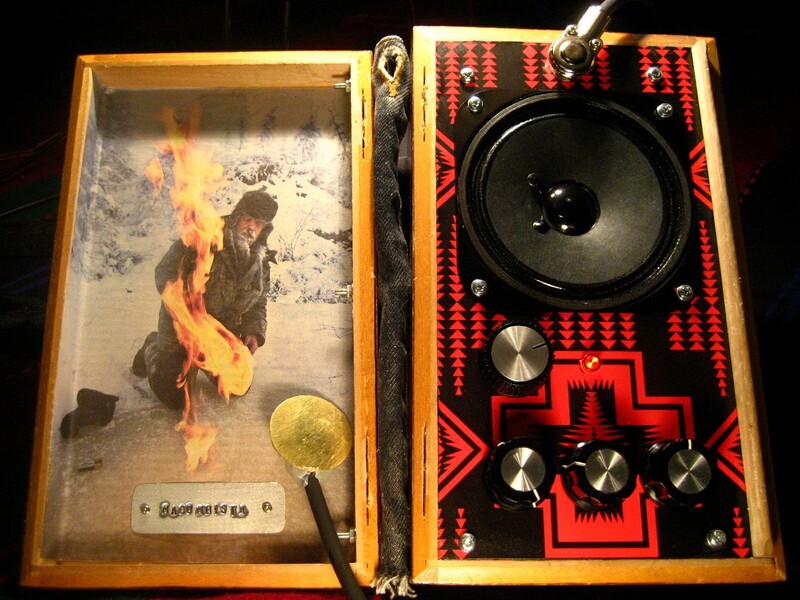 The three elements of the Ghost Locket Triptych will be available for sale individually or as a set following the performance in Aarhus. 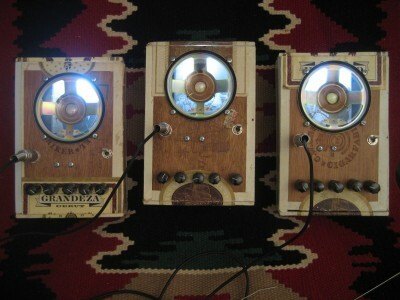 THE EDITION IS SOLD. Please contact the artist for more information. The Chaotic Colorfields performance exploits the psychological intensification which pulsed light adds to the audience’s perception of a sonic event, as well as the physical effect upon the receptors of the eye created by contrasting colorfields. 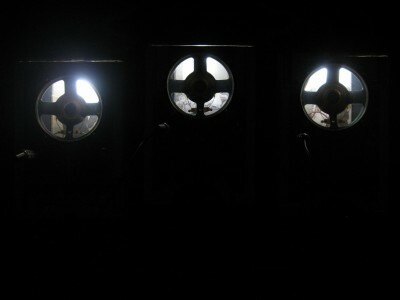 Four colored strobes are directly driven by a self-built analog synthesizer set up to calculate a variety of chaotic feedback systems. Louder than bright and brighter than loud. Chaotic systems are deterministic dynamic systems that have a high sensitivity to initial conditions. 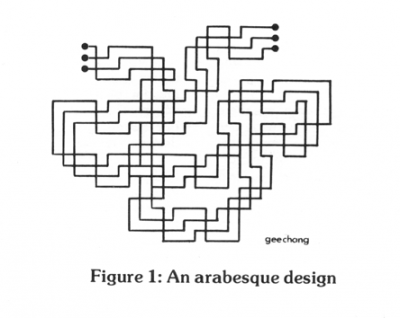 Only dynamic systems that include a nonlinear feedback path are capable of chaotic behavior. Common examples of chaotic systems include coupled pendulums, pseudorandom number generators, and the earth’s weather system[…] Nonlinearity and feedback are necessary conditions for the existence of chaotic processes. …as the column of unknown colour flared suddenly stronger and began to weave itself into fantastic suggestions of shape which each spectator described differently, there came from poor tethered Hero such a sound as no man before or since ever heard from a horse[…] That was the last of Hero till they buried him next day. 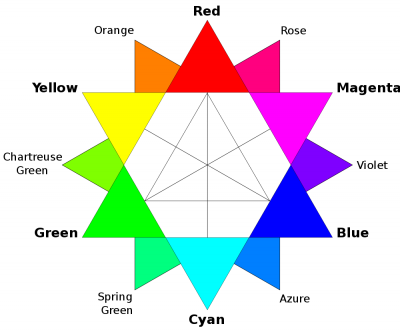 Non-physical, unrealizable, or imaginary colors are points in a color space that correspond to combinations of cone cell responses that cannot be produced by any physical (non-negative) light spectrum. Thus, no object can have an imaginary color, and imaginary colors cannot be seen under normal circumstances. Nevertheless, they are useful as mathematical abstractions for defining color spaces. If a saturated green is viewed until the green receptors are fatigued and then a saturated red is viewed, a perception of red more intense than pure spectral red can be experienced. This is due to the fatigue of the green receptors and the resulting lack of their ability to desaturate the perceptual response to the output of the red receptors. In a viewer’s experience, the perceptual interpretation of the context is expressed in the color itself; we usually cannot, or only with unreasonable effort, separate the “real” color from its context. In particular, we are normally completely unaware of the “cognitive” aspects of color perception — discounting the illuminant, spatial perspective, shadows, memory, object concepts, available color labels, and so on. 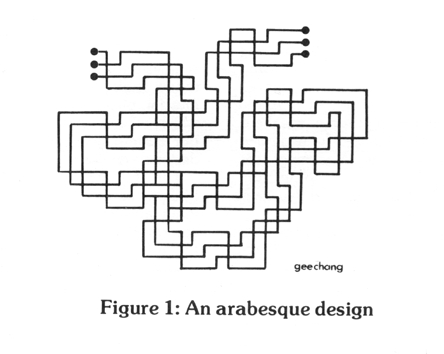 Slater, Dan, “Chaotic Sound Synthesis”, Computer Music Journal 22.2 19 September 1998, pp 12-19. Lovecraft, H.P., “The Colour Out of Space“, “Amazing Stories” September 1927. Lindsay, Peter and Norman, Donald, “Human Information Processing,” Academic Press, 1972, pp 196–216. 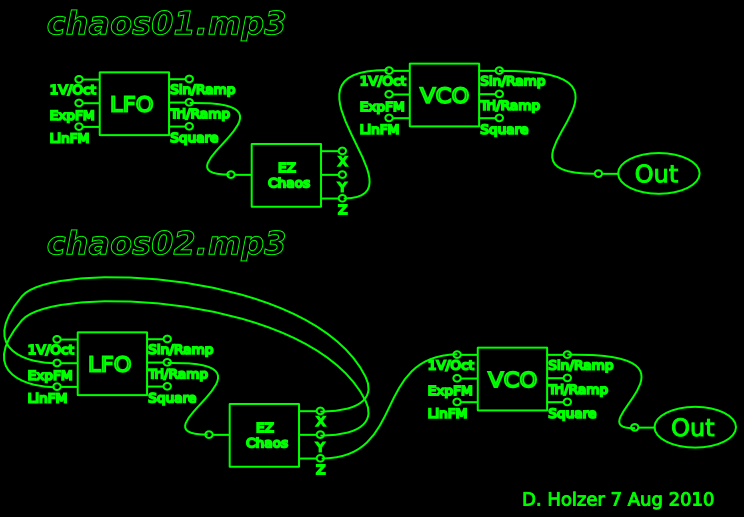 In the first example, chaos01.mp3, the triangle waveform of the LFO drives the EZ Chaos. 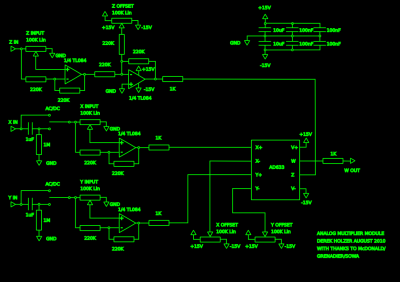 The Z (marked NL on schematic) output of the EZ Chaos drives the 1V/Oct input of the VCO. 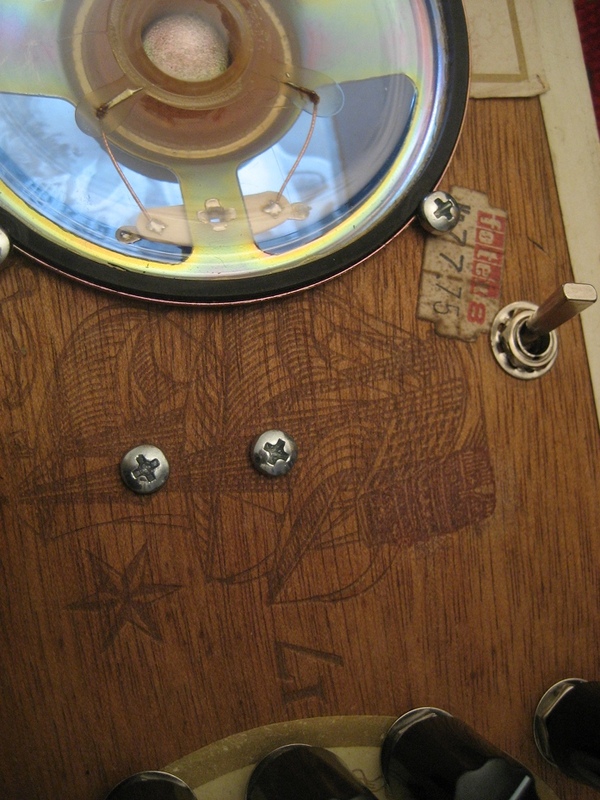 Both Drive and Rate pots are set about at the middle, and the Damping is totally turned down. 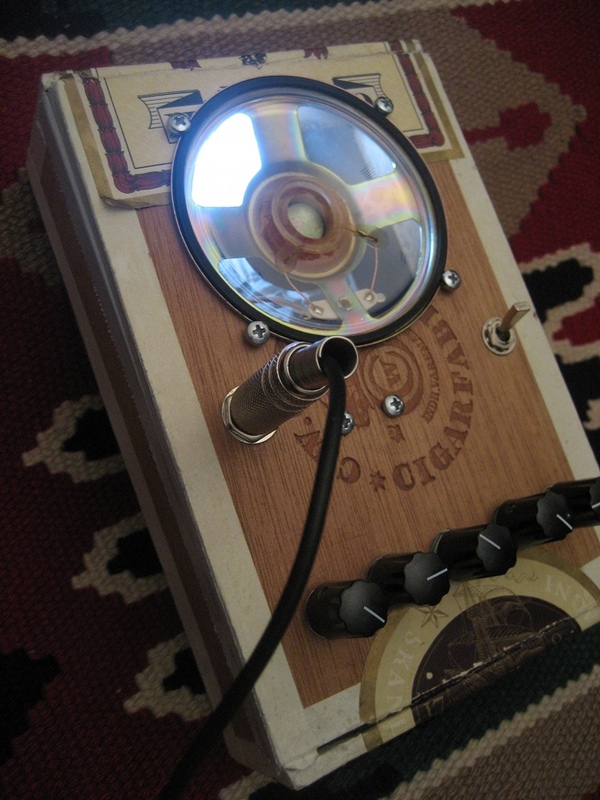 As you can hear, it maintains a very steady modulation. The changes in modulation pattern only come from my manually adjusting the LFO. 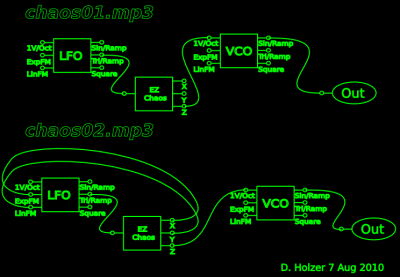 In the second example, chaos02.mp3, the poti settings and routing remain the same from chaos01.mp3. 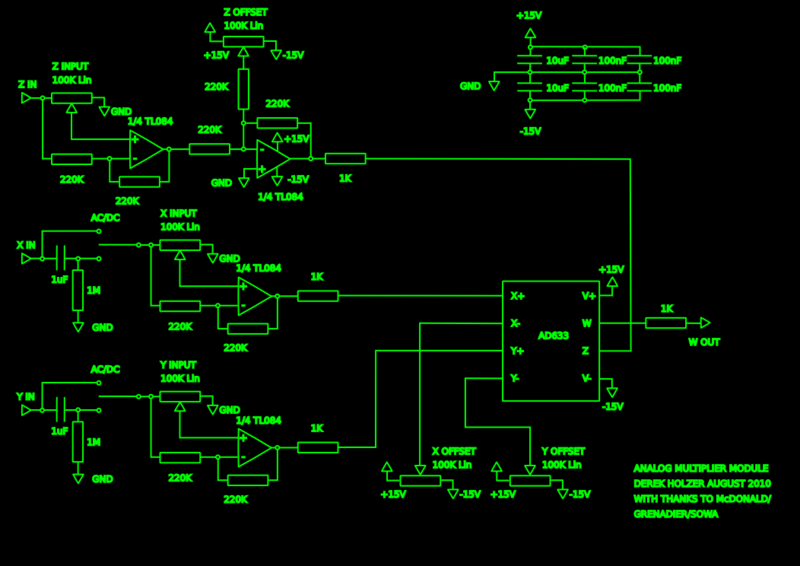 However, I have routed the Y output to the Linear FM of the LFO, and the X output to the Exponential FM of the LFO. The modulations become much more chaotic in this setup. Through the clip, I adjust the depth of the LinFM, ExpFM and the general rate of the LFO. Better, don’t you think? For me, the modulation patterns in chaos01.mp3 sound to me like a non-linear transfer function, but don’t sound chaotic at all in the sense that the transfer function remains almost identical for every cycle of the LFO at any frequency tested. 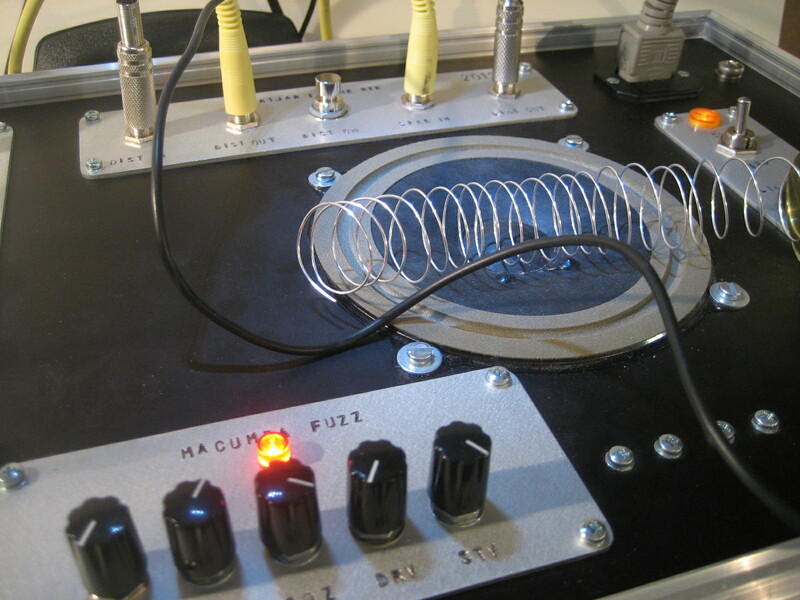 My understanding of chaotic synthesis usually involves feedback between at least two–but in my experiments up to 8–cross-modulated VCOs with a non-linear function in the feedback loop. The results tend towards certain attractors, but every cycle is distinct from the previous one, even if after 3 or 7 or 15 cycles you might return to a common origin. Assuming that my EZ Chaos circuit functions as it should, the benefit I see out of it would be the ability to make chaotic patterns from a single LFO through the feedback. 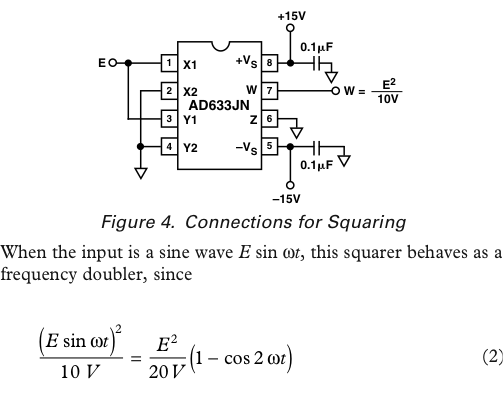 Normally I would have to use 2 or more LFOs to get the same kind of chaotic oscillations. 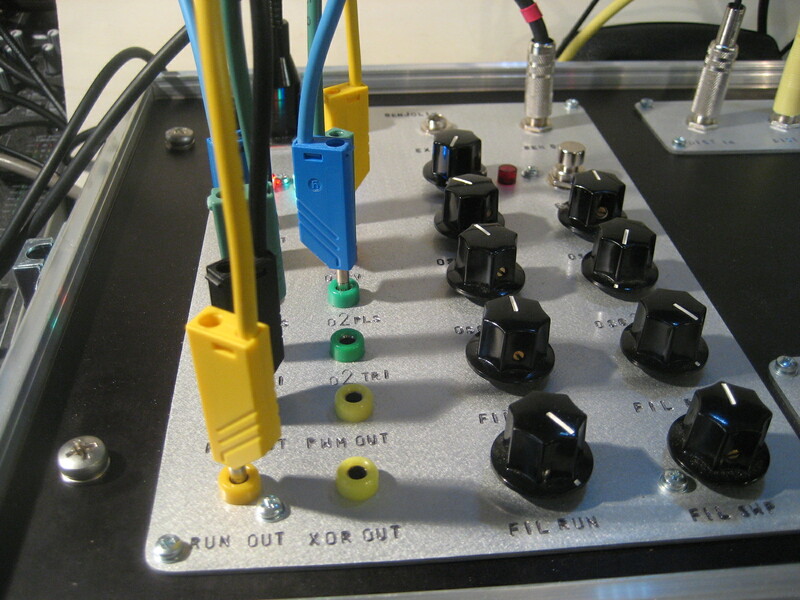 Updated info on the chaos circuit as well as some tuning tips can be found on the Elby Designs page for their ED108-ChaQuO module. 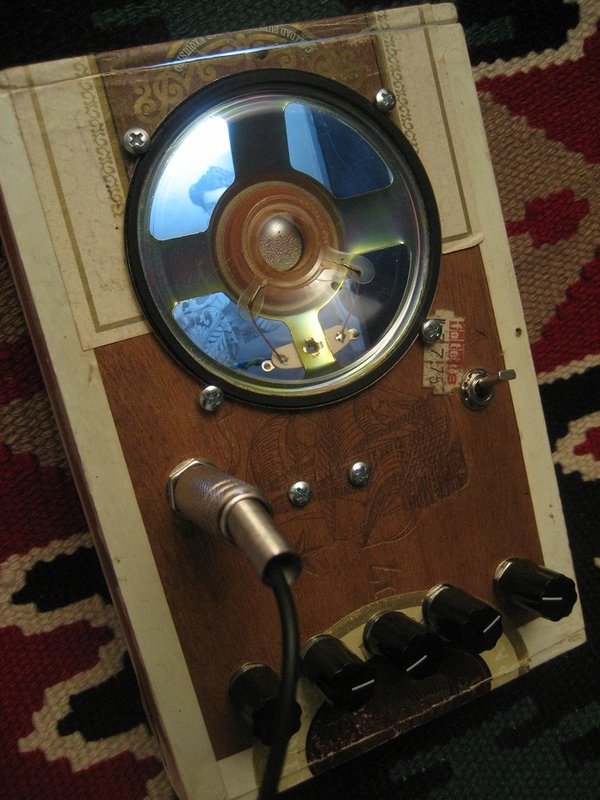 It contains one section with three attenuverting/bipolar inputs, which allow the user to sweep between the original signal on the right hand side of the potentiometer and an inverted version of the signal on the left hand side, with no signal passing through at the middle position. 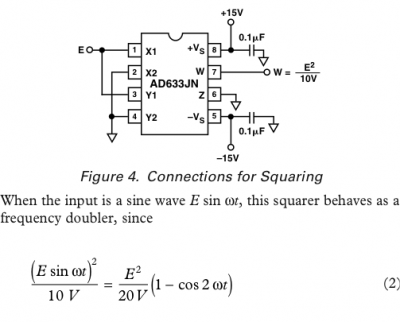 An offset control is also present to add a fixed DC voltage to the signal. The panel contains two of each section. The X and Y inputs can be switched between AC and DC coupling, with an AC breakpoint of approximately 0.2 Hz, while the Z input is always DC coupled. Tom Bugs described himself as a magpie to me once in regards to his circuit designs, and while working on this module I have followed his lead. The “attenuverter” sections were designed by Chris MacDonald and modified by Peter Grenader, and have been further developed by Matthias Herrmann/Fonitronik. Likewise the analog multiplier section is really just bringing every feature of the AD633 4 quadrant multiplier chip to the front panel, with some inspiration from Roman Sowa’s Ring Modulator design, as well as Marc Bareille’s adaption of that same design. 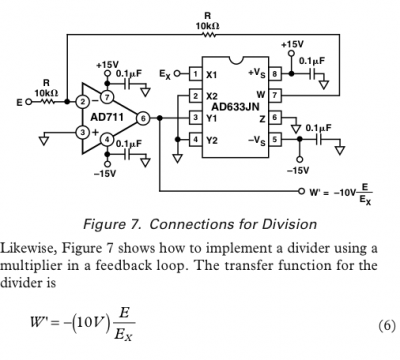 The AD633 documentation shows different applications such as simple multiplication, squaring and division as well as more complex tasks such as a linear Voltage Controlled Amplifier as well as 6dB/Octave Voltage Controlled Filters and a Quadrature Oscillator (both not shown here). 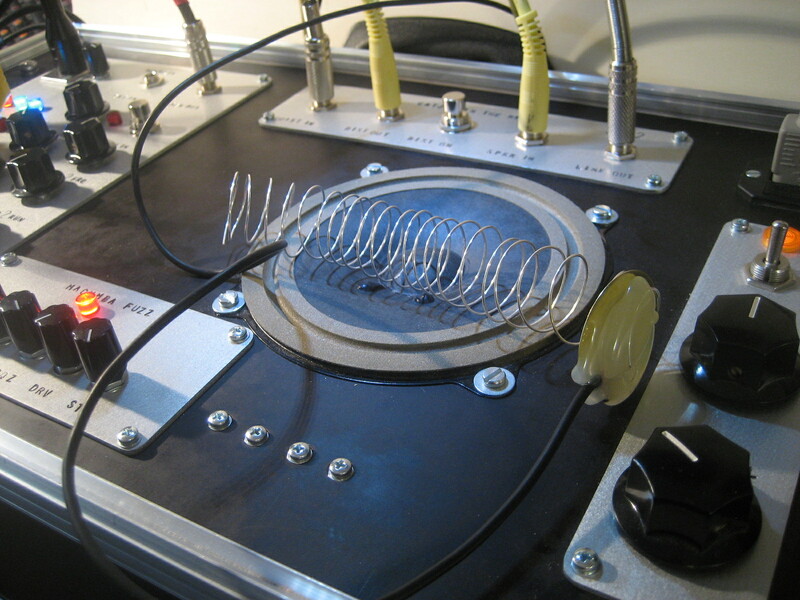 The most common sonic use of this IC is for ring modulator circuits. However, my main application for this is the creation of different kinds of transfer functions for use in chaotic synthesis. I discovered how useful the analog multiplier is while experimenting with the Doepfer system at KHM in Cologne. 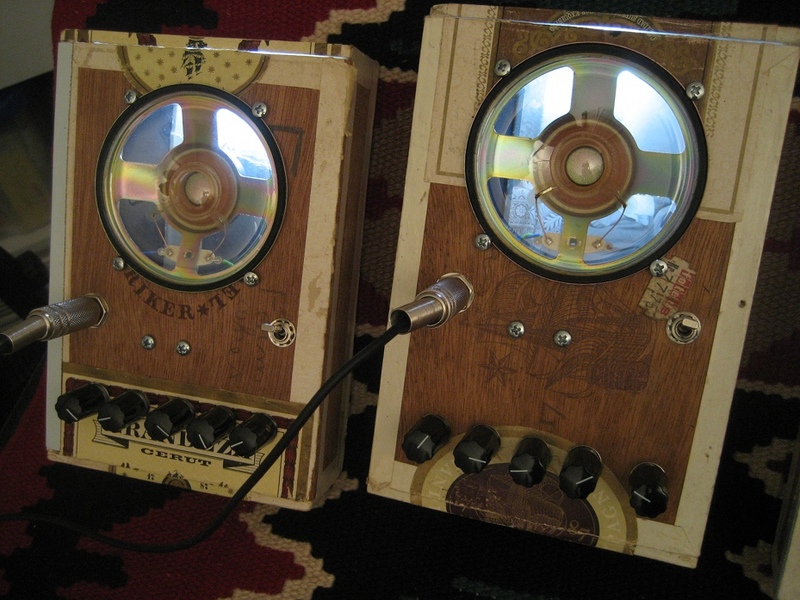 Multiplying two oscillators through a ring modulator, sending the result to modulate the first oscillator and using the first to modulate the second created an amazing array of unpredictable but certainly far from random results. In most applications shown in the datasheet, the X and Y offset pins are grounded. But while breadboarding, I discovered that the X and Y offset gave a higher level of control over the modulations, so I built them into the panel. Likewise, switching between AC and DC coupling alters the resulting sound immensely, with the best results coming from one signal being AC coupled and one being DC coupled. 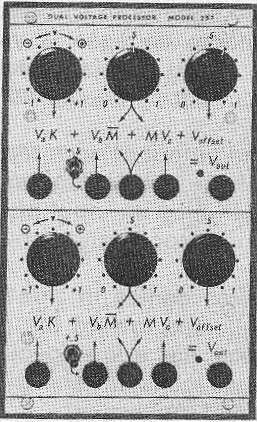 Adding one of the X or Y input signals to the Z input creates a kind of VCA which strengthens the effect. Or using another signal, such as a Low Frequency Oscillator with some suitable gain and offset, adds another modulation source into the mix to provide anything from amplitude modulation to clipping. 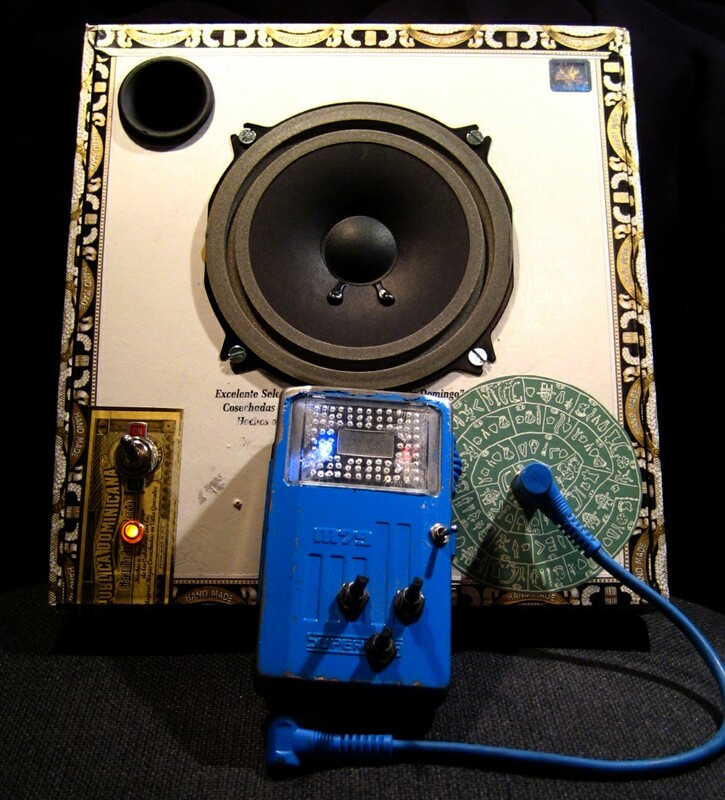 I believe this module gets at just about any type of processing the AD633 can do, as most of the time there is no attenuation, inversion, Z input or any kind of offset available on a normal ring modulator or analog multiplier. I’ve been having some great correspondence with Jason R. Butcher about Buchla synthesizers, analog computers and chaotic synthesis techniques. He reminded me of a very special version of the Buchla 200 Music Box, created by Don Buchla for an electronics and cello work by Ami Radunskaya called Sili-Con Cello in about 1978 or 1979. 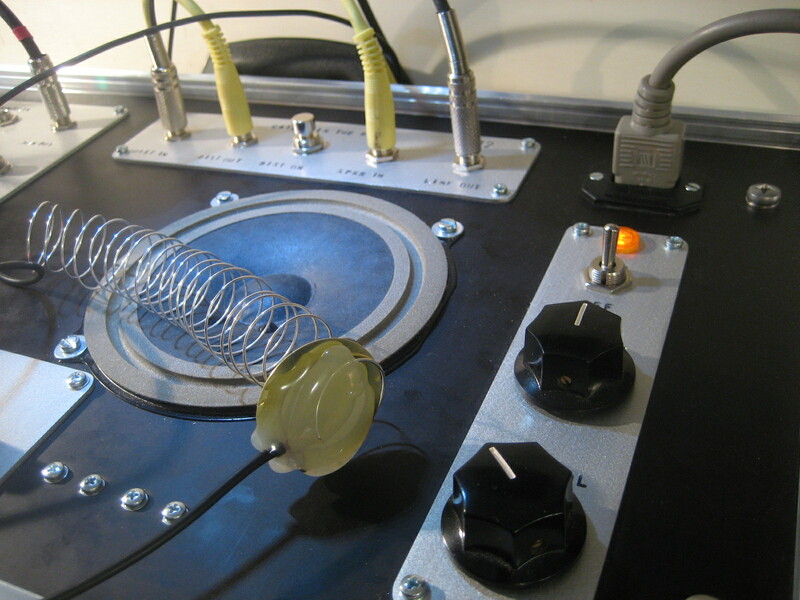 One of its features was a breadboard prototyping module, seen in the upper left corner. 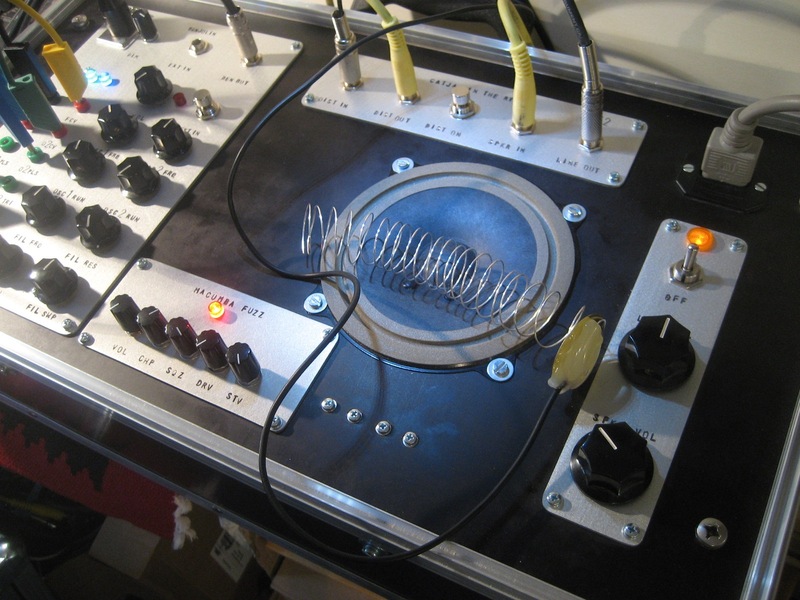 Here, Buchla created custom circuits to respond to the performance gestures of acoustic instruments in the era before Pure Data or Max/MSP. 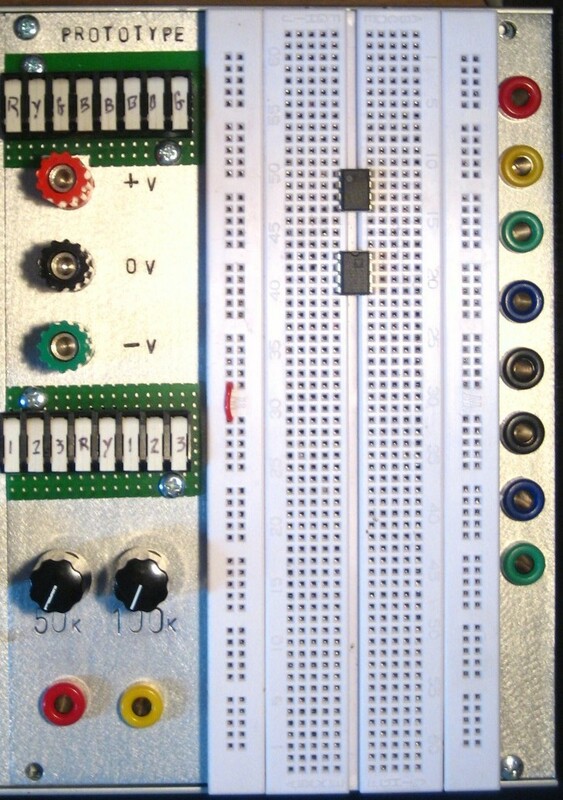 Jason showed me his own version of the breadboard module, which just happened to look a lot like a panel I spec’ed out last night. 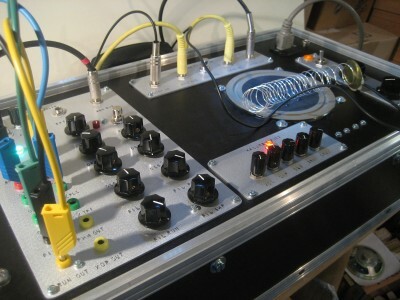 Here’s the completed module mounted in the case this afternoon. Each panel component (potentiometers and banana jacks) is routed to the terminals (the green areas), which in turn can be jumpered anywhere on the breadboard. The only thing it won’t be able to do is the “transfer control” (i.e. 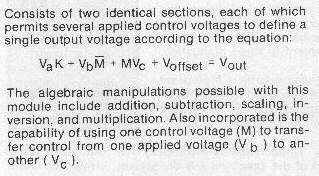 interpolate) between the two different applied voltages (although this could probably be done with a pair of Voltage Controlled Amplifiers rigged up as a cross-fader). This new processor module represents one section of a larger analog computer project I plan to use for developing new chaotic synthesis techniques. The other sections would be a set of integrators (planned), an analog logic section (completed) and a suite of tools for working with digital pulses (comparators, clock dividers, digital logic and digital noise–all planned). Of course, this prototyping module could also be used to lay out other kinds of non-linearizing functions to stick in the chaotic feedback paths. I’ll document those as they come up. As for Mr. Butcher, check out his wild, live analog synthesizer project with Don Hassler. 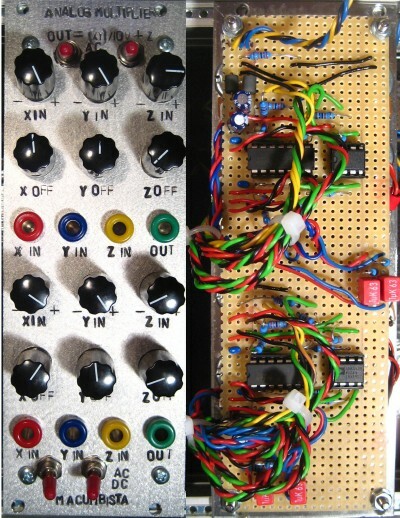 Buchla 200 Music Box vs EMS Synthi A, highly recommended! Powered by WordPress v 5.0.2. Page in 0.649 seconds.